Where does the leak start? 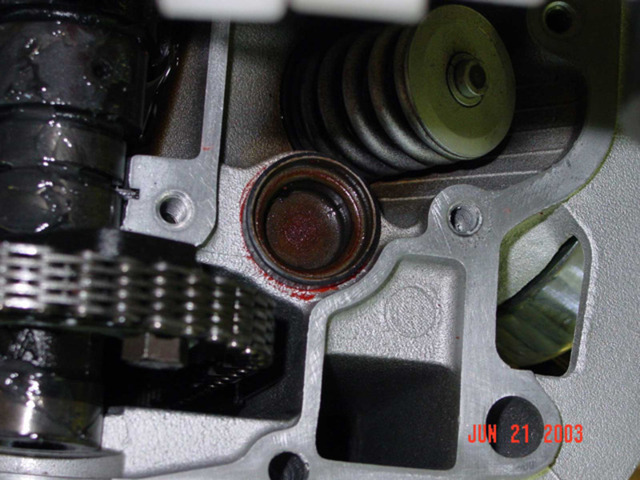 There is a plug/cap in the headcover/camshaft cover, that is right above this cylinder nut. Nope, this is not staged. My spouse got her nails dirty and did this herself....I just held the camera. 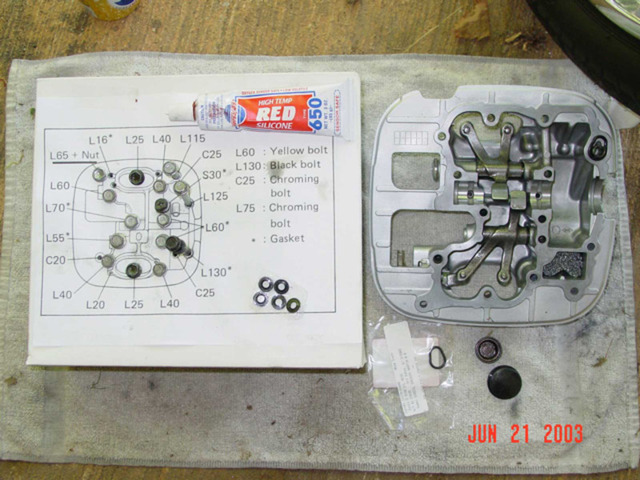 To remove the headcover, you should use a manual because you will remove all these bolts. They are different lengths and some have seals or "gaskets" under them. 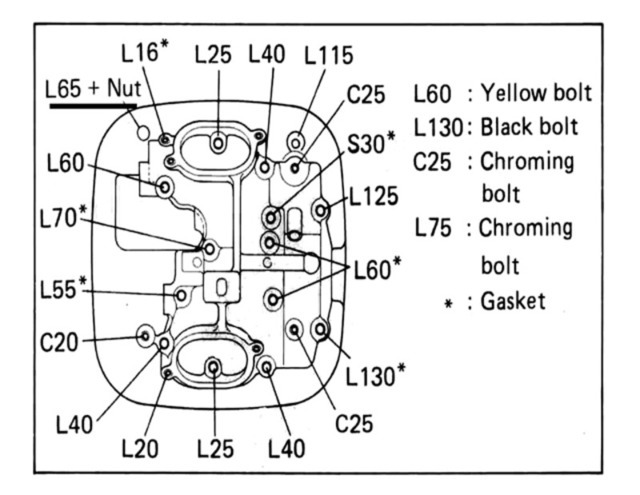 BTW - the L65 bolt + nut and the L70 bolt are ones you want to pay attention to when you remove the headcover. 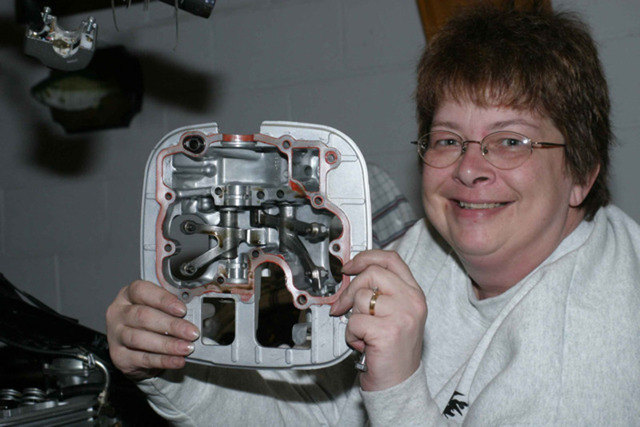 This is where you are going in the cylinder head. This is what the seal (plug/cap) looks like all cleaned up. There are 2 types of plug/cap on the dealer's parts shelves. (In the last couple years a newer one has become available). This is the older style one. These are the parts you MAY need. There are gaskets under some bolts. There is an o-ring, too. You only need a thin layer if high temp silicone sealer, but you must clean the surface real well first. No scraping or gouging either. Poke holes in the box to keep your bolts organized. 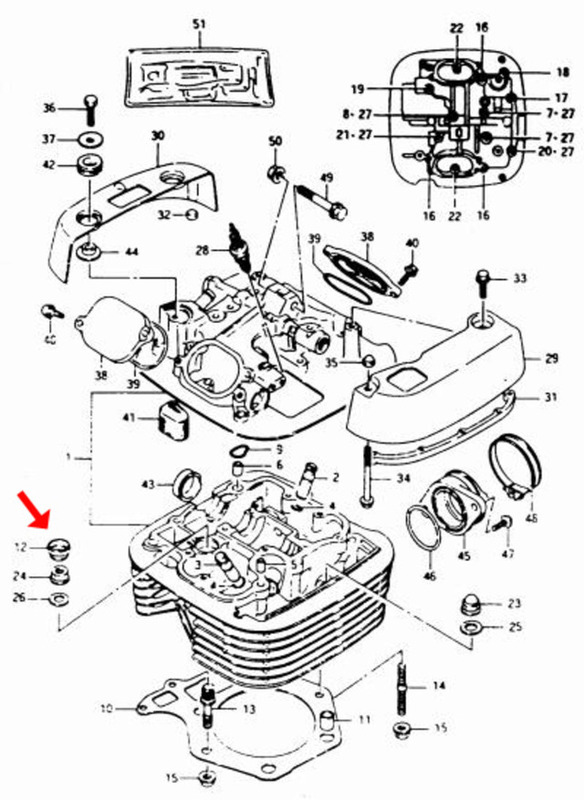 Also, don't forget the o-ring and the stainless screen in the oil breather....AND use a torque wrench on the bolts. Total work time? As little as 4 hours. Good luck. I forgot to add this one. This is what I posted on a website in 2001, and no one could help me. So I decided to learn how to fix it. By the way. Does that mean that the new & improved plug has corrected the leak issue at that area? Also if this was/is a chronic complaint has Suzuki given assistance to correct this customer concern? Well, I dunno....see, the head nuts are sort of located in 3 different ways. The right rear stud is the longest and goes all the way up into the headcover. The left ones are shorter and completely dry out by the spark plug. So in trying to understand why they all aren't the same is a little difficult. It has to with the design of the overhead cam and the cam chain tunnel, I guess. But if they were all long, then you'd have to pull the engine to get to the head off. This way, you don't, therefore a plug is needed over the right front nut. I don't know if the new design plug is better or not. I have a new one and my spouse has an old one, and neither are leaking. However, the newer one does seem more robust. Personally, I think they leak because of carelessness. In the area of the plug there is usually a bunch of accumulated road crud around the nut. It gets in that air passage around the nut, and anyone that's been there knows that it is just gritty and needs to be cleaned out. This is where I think it starts. People retorque the head nuts, don't clean the surfaces well, and just poke the plug back in the hole when they're done. I also think that it starts with that first initial dealer service....at least that is what I believe caused both of ours to leak. I'm not certain about mine, but I'm very certain about my spouse's. When my spouse's leaked, and I went back in there, I found that her plug was only partially pushed in the hole. In fact, it was c_o_c_ked on an angle and that tells me the leak was started by the dealer's mechanic. Also, on the 3 different engines that I've repaired, none ever had any sealer on the plug. Why not? The headcover gets sealer, so why not the plug too? So with that I always use a bit of sealer around the plug when I replace it.....and altogether, I guess that I've removed the Savage headcover about 8 times for different reasons on different bikes. Why is't there any sealant on the plug?? It's NOT in the Suzuki workshop manual. That's why the dealer mechanics don't apply it. That's true. It tells you to seal the headcover, but not the plug. Of course, if you don't correctly install the plug it's gonna leak anyway. Thanks for this thread Greg -- I am planning to dive in this weekend and try to fix my leak. My manual specifies 'Three Bond No. 1216' to seal the cylinder head cover -- but I am having some trouble locating it. Is this what people are using, or is there an equivalent? I was planning to use Permatex/RTV Gray. Is that appropriate? 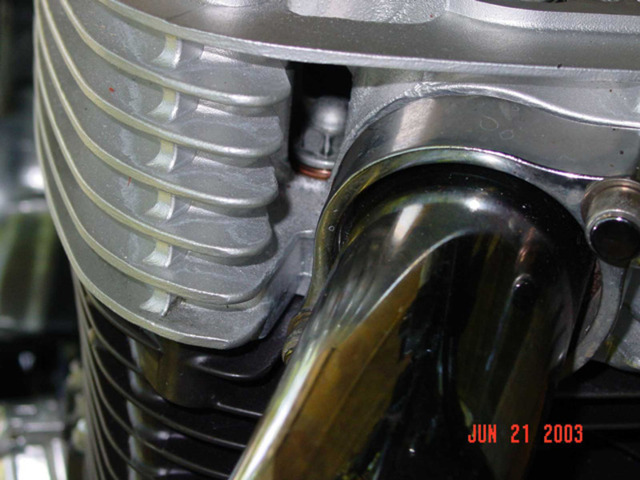 On the 460 Ford we used Permatex Aviation form-a-gasket sealant. I figure if it is good enough for an air-cooled aircraft engine it should be fine on a air-cooled bike.